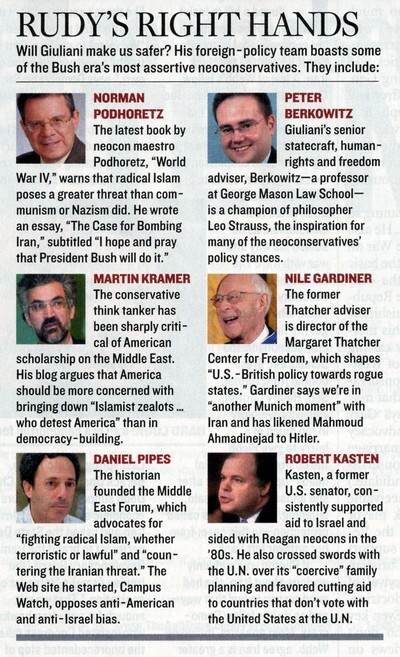 Newsweek, Oct. 15, 2007, gets only five out of six identifications wrong. The subsequent correction warrants a place in Guinness World Records. Editor's Note: In our print edition, several captions for the photographs accompanying this report were inadvertantly transposed. Martin Kramer's photograph is identified as Norman Podhoretz; Daniel Pipes's photograph is identified as Kramer; Peter Berkowitz's photograph is identified as Pipes; Nile Gardiner's photograph is identified as Berkowitz's and Podhoretz's photograph is identified as Gardiner's. NEWSWEEK regrets the errors. Comments: (1) There are six pictures in all on the page and five of the six captions are wrong; only that of Robert Kasten is correct. Aggregating so many errors at once takes real talent – but count on Newsweek. (2) The inevitable implication is that, for Newsweek staff, all conservatives look alike. (3) The accuracy of the picture captions provides an apt commentary for the rest of Newsweek's wretched coverage in this article. Oct. 22, 2007 update: I was not the only one to get a good laugh from the sidebar. Here is the Weekly Standard's take. "The Weekly Standard" ridicules "Newsweek." 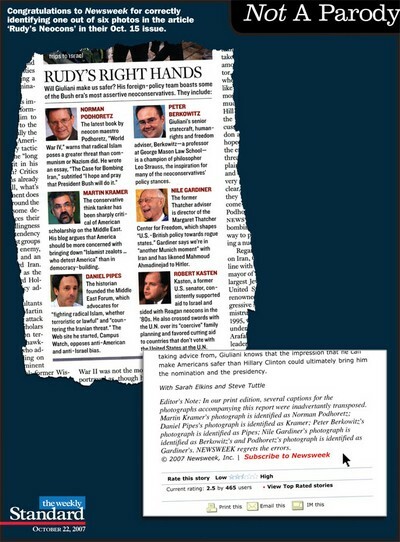 Oct. 25, 2007 update: Proving its editorial prowess, New York Times ran a story today on Giuliani's foreign policy advisors ("Mideast Hawks Help to Develop Giuliani Policy") and got ALL the names and pictures right. But the import of the article is as nasty as the Newsweek one. Comment: Connoisseurs of the Middle East Quarterly might note that all three of its editors are featured here, indeed right in a row – myself, Michael Rubin, and Martin Kramer. The New York Times gets the names and pictures right.